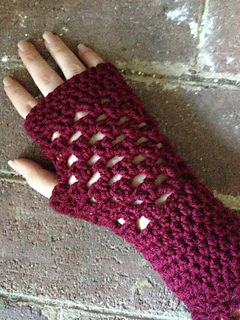 This pattern uses worsted weight yarn and a size 4mm crochet hook. 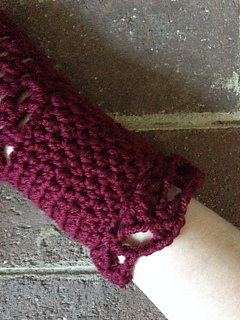 The pattern will work as written if you have a 5.5-6.5 inch wrist and a thumb circumference of 2-3 inches. 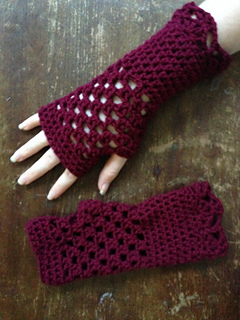 For a 6.5 or 7.5 inch wrist, go up a hook size (4.5 mm) or for a larger wrist you can even go up to a 5mm crochet hook. Gauge is 3.25 hdc stitches to an inch when working in the round. There is a video detailing how I crochet this. I hope it will help clarify any confusing steps! It can be seen here. A arm to put the finished item on.